Most school districts are out this week, and that means summer is almost here! While that has no affect on our daily lives, it is still fun to think of new and different things to do in order to survive the long, hot summer. It's barely June, and Austin has already reached 100 degrees. I have a feeling it's going to be a rough one. Water activities are a must if you want to keep your cool in Austin. If you can't be around water, then you better be in the cold AC. 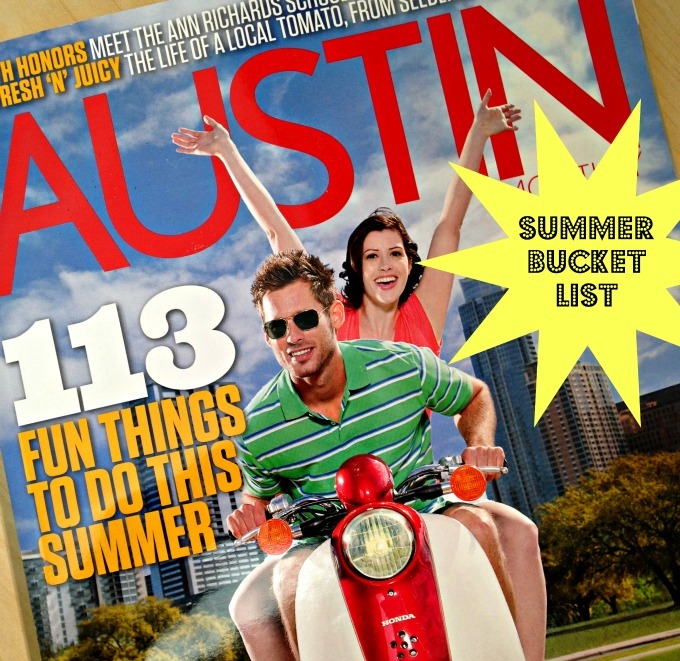 Inspired by the latest Austin Monthly issue, we decided to put together our very own summer fun list, with a variety of indoor and outdoor activities. There are so many times that we've said "we should do <insert activity> sometime", but never get around to doing it. So we're hoping that by having a list, we can reference it and cross off a few things. Many of these are things we've never done, and we also tried hard to find a few that don't cost much. It might change a bit, but at least we'll have inspiration to get out and do some fun things this summer. Here is our Summer Bucket List: 2013!! What about you? Any fun plans to make it through the summer?